Drawing of the structure of cork as it appeared under the microscope to Robert Hooke from Micrographia, which is the origin of the word "cell". Cells in culture, stained for keratin (red) and DNA (green). The cell is a membrane-enclosed body that is the structural and functional unit of living organisms, being the smallest unit that can carry on all life processes, including maintenance, growth, replication, and self-repair. As such, it is sometimes called the "building block of life" (Alberts et al. 2002). Some organisms, such as bacteria, are unicellular, consisting of a single cell. Other organisms, such as humans, are multicellular. Humans have an estimated 100 trillion or 1014 cells; a typical cell size is 10 µm, a typical cell mass 1 nanogram. However, while a general characteristics of cells is that they are microscopic in size, biological cells also include vertebrate eggs (or ovum, the female reproductive cell), which commonly are visible to the unaided human eye, as well as nerve cells that can be very long in some organisms (perhaps 12 meters or 39 feet in the giant squid); there also are single-celled algae (genus Caulerpa) up to 3 meters or 10 feet in length. All living organisms, with the exception of viruses (and there is debate whether or not they can be considered living organisms), consist of cells, demonstrating the unity, harmony, and interconnectedness of life. The cell theory, first developed in 1839 by Matthias Jakob Schleiden and Theodor Schwann, states that all organisms are composed of one or more cells; all cells come from preexisting cells; all vital functions of an organism occur within cells, and cells contain the hereditary information necessary for regulating cell functions and for transmitting information to the next generation of cells. The word cell comes from the Latin cellula, a small room. The name was chosen by Robert Hooke when he compared the cork cells he saw to the small rooms monks lived in. The specialization of cells in multicellular organisms to form many different organs and bodily systems all integrated into a harmonious, hierarchically arrayed collective, with each component of equal value and essential to the function of the whole, demonstrates a principle and pattern of organization that provides an analogue for systems of higher order, like ecosystems, families, and nations. The study of cells is called cell biology or cellular biology. A cell is the basic unit of life, being the smallest unit of life that can carry on all life processes (see life). Each cell is at least somewhat self-contained and self-maintaining: it can take in nutrients, convert these nutrients into energy or component parts, carry out specialized functions, and reproduce as necessary. Each cell stores its own set of instructions for carrying out each of these activities. Mouse cells grown in a culture dish. These cells grow in large clumps, but each individual cell is about 10 micrometers across. Reproduction by cell division (binary fission, mitosis or meiosis). Use of enzymes and other proteins, which are coded for by DNA organized into genes and are produced through the action of messenger RNA intermediates and ribosomes. Metabolism, including taking in raw materials, building cell components, converting energy, and releasing by-products. The functioning of a cell depends upon its ability to extract and use chemical energy stored in organic molecules. This energy is derived through reactions conducted along metabolic pathways. Response to external and internal stimuli such as changes in temperature, pH, or nutrient levels. Cell contents are enclosed by a cell surface membrane, a lipid bilayer within which are floating up to thousands of protein molecules. Although some few prokaryotic cells use internal membranes as a site of metabolism, prokaryotic cells characteristically lack internal membrane-bound compartments, while eukaryotic cells have a highly specialized endomembrane system, characterized by regulated traffic and transport vesicles. There are two basic types of cells, eukaryotic and prokaryotic. Prokaryotic cells are usually single, while eukaryotic cells are usually found in multicellular organisms. Prokaryotes are distinguished from eukaryotes on the basis of nuclear organization, specifically their lack of a nuclear membrane. Prokaryotes also lack most of the intracellular organelles and structures that are characteristic of eukaryotic cells. (An exception is the ribosomes, which are present in both prokaryotic and eukaryotic cells. However, the term organelle is commonly restricted to describing sub-cellular components that include a phospholipid membrane, which ribosomes, being entirely particulate, do not. For this reason, ribosomes are sometimes be described as "non-membranous organelles.") 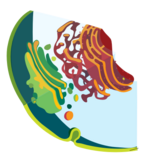 Most of the functions performed by eukaryote organelles, such as mitochondria, chloroplasts, and the Golgi apparatus, are done by the prokaryotic plasma membrane. Prokaryotic cells have three architectural regions: (1) appendages called flagella and pili—proteins attached to the cell surface; a cell envelope consisting of a capsule, a cell wall, and a plasma membrane; and a cytoplasmic region that contains the cell genome (DNA), ribosomes, and various sorts of inclusions. The plasma membrane (a phospholipid bilayer) separates the interior of the cell from its environment and serves as a filter and communications beacon. 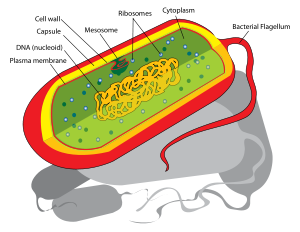 Most prokaryotes have a cell wall (some exceptions are Mycoplasma, a bacterium, and Thermoplasma, an archaeon. It consists of peptidoglycan in bacteria, and acts as an additional barrier against exterior forces. It also prevents the cell from "exploding" (cytolysis) from osmotic pressure against a hypotonic environment. A cell wall is also present in some eukaryotes like fungi, but has a different chemical composition. A prokaryotic chromosome is usually a circular molecule (an exception is that of the bacterium Borrelia burgdorferi, which causes Lyme disease). Even without a real nucleus, the DNA is condensed in a nucleoid. Prokaryotes can carry extrachromosomal DNA elements called plasmids, which are usually circular. Plasmids can carry additional functions, such as antibiotic resistance. Eukaryotic cells are about 10 times the diameter of a typical prokaryote and can be as much as 1000 times greater in volume. The major difference between prokaryotes and eukaryotes is that eukaryotic cells contain membrane-bound compartments in which specific metabolic activities take place. Most important among these is the presence of a cell nucleus, a membrane-delineated compartment that houses the eukaryotic cell's DNA. It is this nucleus that gives the eukaryote its name, which means "true nucleus." The plasma membrane resembles that of prokaryotes in function, with minor differences in the setup. Cell walls may or may not be present. The eukaryotic DNA is organized in one or more linear molecules, called chromosomes, which are associated with histone proteins. All chromosomal DNA is stored in the cell nucleus, separated from the cytoplasm by a membrane. Some eukaryotic organelles also contain some DNA. Eukaryotes can move using cilia or flagella. The flagella are more complex than those of prokaryotes. The cells of eukaryotes (left) and prokaryotes (right). All cells, whether prokaryotic or eukaryotic, have a membrane, which envelopes the cell, separates its interior from its environment, regulates what moves in and out (selectively permeable), and maintains the electric potential of the cell. Inside the membrane, a salty cytoplasm takes up most of the cell volume. All cells possess DNA, the hereditary material of genes, and RNA, containing the information necessary to build various proteins such as enzymes, the cell's primary machinery. There are also other kinds of biomolecules in cells. This article will list the primary components of the cell and briefly describe their function. The cytoplasm of a cell is surrounded by a plasma membrane. The plasma membrane in plants and prokaryotes is usually covered by a cell wall. This membrane serves to separate and protect a cell from its surrounding environment and is made mostly from a double layer of phospholipid molecules, each molecule being a composite of a lipid (hydrophobic fat-like molecule) and hydrophilic phosphate and amino groups. In water, millions of phospholipid molecules join to form a phospholipid bilayer, which may also be called a fluid mosaic membrane. Embedded within this membrane are different types of protein molecules that act as channels and pumps moving different molecules into and out of the cell. The membrane is said to be 'semi-permeable', in that it can either let a substance (molecule or ion) pass through freely, pass through to a limited extent or not pass through at all. Cell surface membranes also contain receptor proteins that allow cells to detect external signaling molecules such as hormones. The cytoskeleton acts to organize and maintain the cell's shape; anchors organelles in place; helps during endocytosis, the uptake of external materials by a cell, and cytokinesis, the separation of daughter cells after cell division; and helps move parts of the cell in processes of growth and mobility. Eukaryotic cytoskeleton comprises microfilaments, intermediate filaments, and microtubules. A great number of associated proteins are involved in maintaining a cell's structure by directing, bundling, and aligning filaments. Two different kinds of genetic material exist: deoxyribonucleic acid (DNA) and ribonucleic acid (RNA). Most organisms use DNA for their long-term information storage, but some viruses (e.g., retroviruses) have RNA as their genetic material. The biological information contained in an organism is encoded in its DNA or RNA sequence. RNA is also used for information transport (e.g., mRNA) and enzymatic functions (e.g., ribosomal RNA) in organisms that use DNA for the genetic code itself. Prokaryotic genetic material is organized in a simple circular DNA molecule (the bacterial chromosome) in the nucleoid region of the cytoplasm. Eukaryotic genetic material is divided into different, linear molecules called chromosomes inside a discrete nucleus, usually with additional genetic material in some organelles like mitochondria and chloroplasts (see endosymbiotic theory). A human cell has genetic material in the nucleus (the nuclear genome) and in the mitochondria (the mitochondrial genome). In humans, the nuclear genome is divided into 46 linear DNA molecules called chromosomes. The mitochondrial genome is a circular DNA molecule separate from the nuclear DNA. Although the mitochondrial genome is very small, it codes for some important proteins. Foreign genetic material (most commonly DNA) can also be artificially introduced into the cell by a process called transfection. This can be transient, if the DNA is not inserted into the cell's genome, or stable, if it is. 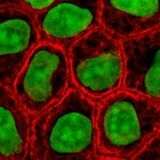 Just as the human body cmprises many different organs, such as the heart, lung, and kidney, with each organ performing a different yet essential function, cells also have a set of "little organs," called organelles, that are adapted and/or specialized for carrying out one or more vital functions. Membrane-bound organelles are found only in eukaryotes. The cell nucleus is the most conspicuous organelle found in an eukaryotic cell. It houses the cell's chromosomes, and is the place where almost all DNA replication and RNA synthesis occur. The nucleus is spheroid in shape and separated from the cytoplasm by a double membrane called the nuclear envelope. The nuclear envelope isolates and protects a cell's DNA from various molecules that could accidentally damage its structure or interfere with its processing. During processing, DNA is transcribed, or copied into a special RNA, called messanger RNA (mRNA). This mRNA is then transported out of the nucleus, where it is translated into a specific protein molecule. In prokaryotes, DNA processing takes place in the cytoplasm. Mitochondria are self-replicating organelles that occur in various numbers, shapes, and sizes in the cytoplasm of all eukaryotic cells. As mitochondria contain their own genome that is separate and distinct from the nuclear genome of a cell, they play a critical role in generating energy in the eukaryotic cell, a process involving a number of complex metabolic pathways. Chloroplasts are larger than mitochondria, and convert solar energy into a chemical energy ("food") via photosynthesis. Like mitochondria, chloroplasts have their own genome. Chloroplasts are found only in photosynthetic eukaryotes, like plants and algae. 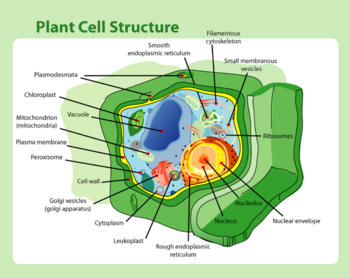 There is a number of plant organelles that are modified chloroplasts; they are broadly called plastids, and are often involved in storage. The endoplasmic reticulum (ER) is the transport network for molecules targeted for certain modifications and specific destinations, as compared to molecules that will float freely in the cytoplasm. The ER has two forms: the rough ER, which has ribosomes on its surface, and the smooth ER, which lacks them. Translation of the mRNA for those proteins that will either stay in the ER or be exported from the cell occurs at the ribosomes attached to the rough ER. The smooth ER is important in lipid synthesis, detoxification, and as a calcium reservoir. The Golgi apparatus, sometimes called a Golgi body or Golgi complex, is the central delivery system for the cell and is a site for protein processing, packaging, and transport. Both organelles consist largely of heavily-folded membranes. The ER contains many ribosomes (the protein production machine). A ribosome is a large complex composed of many molecules, including RNAs and proteins, and processes the genetic instructions carried by an mRNA. The process of converting an mRNA's genetic code into the exact sequence of amino acids that make up a protein is called translation. Protein synthesis is extremely important to all cells, and therefore a large number of ribosomes—sometimes hundreds or even thousands—can be found throughout a cell. Ribosomes are found in both prokaryotes and eukaryotes, but in prokaryotes they only exist floating freely in the cytosol, whereas in eukaryotes they can be either free or bound to membranes. Lysosomes and peroxisomes are often referred to as the garbage disposal system of a cell. Both organelles are somewhat spherical, bound by a single membrane, and rich in digestive enzymes, naturally-occurring proteins that speed up biochemical processes. For example, lysosomes can contain more than three dozen enzymes for degrading proteins, nucleic acids, and certain carbohydrates called polysaccharides. Here we can see the importance behind compartmentalization of the eukaryotic cell. The cell could not house such destructive enzymes if they were not contained in a membrane-bound system. The centrosome produces the microtubules of a cell—a key component of the cytoskeleton. It directs the transport through the ER and the Golgi apparatus. Centrosomes are composed of two centrioles, which separate during cell division and help in the formation of the mitotic spindle. A single centrosome is present in the animal cells. They are also found in some fungi and algae cells. Vacuoles store food and waste. Some vacuoles store extra water. They are often described as liquid filled space and are surrounded by a membrane. Some cells, most notably Amoeba, have contractile vacuoles, which are able to pump water out of the cell if there is too much water. Between successive cell divisions, cells grow through the functioning of cellular metabolism. Cell metabolism is the process by which individual cells process nutrient molecules. Metabolism has two distinct divisions: catabolism, in which the cell breaks down complex molecules to produce energy and reducing power, and anabolism, wherein the cell uses energy and reducing power to construct complex molecules and perform other biological functions. Complex carbohydrates consumed by the organism can be broken down into a less chemically-complex sugar molecule called glucose. Once inside the cell, glucose is broken down to make adenosine triphosphate (ATP), a form of energy, via two different pathways. The first pathway, glycolysis, requires no oxygen and is referred to as anaerobic metabolism. Each reaction is designed to produce some hydrogen ions that can then be used to make energy packets (ATP). In prokaryotes, glycolysis is the only method used for converting energy. The second pathway, called the Krebs cycle, or citric acid cycle, occurs inside the mitochondria and is capable of generating enough ATP to run all the cell functions. An overview of protein synthesis. Within the nucleus of the cell (light blue), genes (DNA, dark blue) are transcribed into RNA. This RNA is then subject to post-transcriptional modification and control, resulting in a mature mRNA (red) that is then transported out of the nucleus and into the cytoplasm (peach), where it undergoes translation into a protein. mRNA is translated by ribosomes (purple) that match the three-base codons of the mRNA to the three-base anti-codons of the appropriate transfer RNA (tRNA). Newly-synthesized proteins (black) are often further modified, such as by binding to an effector molecule (orange), to become fully active. Main articles: Binary fission, Mitosis, and Meiosis. Cell division involves a single cell (called a mother cell) dividing into two daughter cells. This leads to growth in multicellular organisms (the growth of tissue) and to procreation (vegetative reproduction) in unicellular organisms. Prokaryotic cells divide by binary fission. Eukaryotic cells usually undergo a process of nuclear division, called mitosis, followed by division of the cellular cytoplasm in a process called cytokinesis. A diploid cell may also undergo meiosis to produce haploid cells, usually four. Haploid cells serve as gametes in multicellular organisms, fusing to form new diploid cells. DNA replication, or the process of duplicating a cell's genome, is required every time a cell divides. Replication, like all cellular activities, requires specialized proteins for carrying out the job. Cells are capable of synthesizing new proteins, which are essential for the modulation and maintenance of cellular activities. This process involves the formation of new protein molecules from amino acid building blocks based on information encoded in DNA/RNA. 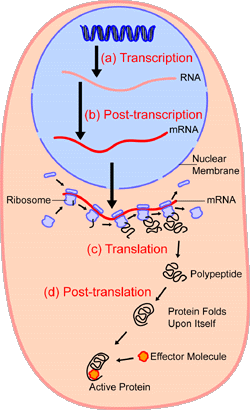 Protein synthesis generally consists of two major steps: transcription and translation. Transcription is the process in which genetic information in DNA is used to produce a complimentary RNA strand. This RNA stand is then processed to give messenger RNA (mRNA), which is free to migrate through the cell. Molecules of mRNA bind to protein-RNA complexes called ribosomes located in the cytosol, where they are translated into polypeptide sequences. The ribosome mediates the formation of a polypeptide sequence based on the mRNA sequence. The mRNA sequence directly relates to the polypeptide sequence by binding to transfer RNA (tRNA) adapter molecules in binding pockets within the ribosome. The new polypeptide then folds into a functional 3D protein molecule. The origin of cells has to do with the origin of life, and was one of the most important steps in evolution of life as we know it. The birth of the cell marked the passage from prebiotic chemistry to biological life. If life is viewed from the point of view of replicators, that is DNA molecules in the organism, cells satisfy two fundamental conditions: protection from the outside environment and confinement of biochemical activity. The former condition is needed to maintain the fragile DNA chains stable in a varying and sometimes aggressive environment. The latter confines biochemical activity to that under the control of the cell, allowing greater control and harmony of its action. Such confinement of DNA chains also is useful in assuring that the benefit or harm provided by a given DNA molecule (or the gene on a particular chromosome) is attached to that DNA. If freely-floating DNA molecules that code for enzymes are not enclosed into cells, the enzymes that benefit of a given DNA molecule (for example, by producing nucleotides) will automatically benefit the neighbouring DNA molecules. Thus the selection pressure on DNA molecules, such as seen in development of bacterial resistance to antibiotics, would be much lower, since there would not be a definitive advantage for the "lucky" DNA molecule that produces the better enzyme over the others: All molecules in a given neighborhood would be almost equally advantaged. Biochemically, cell-like spheroids formed by proteinoids are observed by heating amino acids with phosphoric acid as a catalyst. They bear much of the basic features provided by cell membranes. Proteinoid-based protocells enclosing RNA molecules could (but not necessarily should) have been the first cellular life forms on Earth. The eukaryotic cell is considered by many biologists to have evolved from a symbiotic community of prokaryotic cells. DNA-bearing organelles like the mitochondria and the chloroplasts appear to be remains of ancient symbiotic oxygen-breathing bacteria and cyanobacteria, respectively, where the rest of the cell seems to be derived from an ancestral archaean prokaryote cell – a theory termed the endosymbiotic theory. 1632–1723: Anton van Leeuwenhoek teaches himself to grind lenses, builds a microscope and draws protozoa, such as Vorticella from rain water, and bacteria from his own mouth. 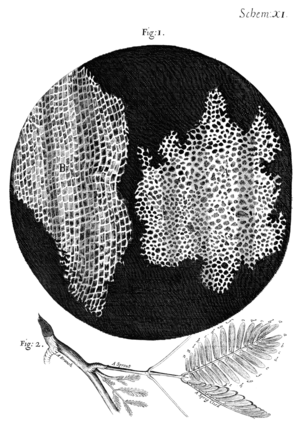 1665: Robert Hooke discovers cells in cork, then in living plant tissue using an early microscope. 1839: Theodor Schwann and Matthias Jakob Schleiden elucidate the principle that plants and animals are made of cells, concluding that cells are a common unit of structure and development, and thus founding the cell theory. The belief that life forms are able to occur spontaneously (generatio spontanea) is contradicted by Louis Pasteur (1822–1895) (although Francesco Redi had performed an experiment in 1668 that suggested the same conclusion). Rudolph Virchow states that cells always emerge from cell divisions (omnis cellula ex cellula). 1931: Ernst Ruska builds first transmission electron microscope (TEM) at the University of Berlin. By 1935, he has built an EM with twice the resolution of a light microscope, revealing previously-unresolvable organelles. 1953: Watson and Crick made their first announcement on the double-helix structure for DNA on February 28. 1981: Lynn Margulis published Symbiosis in Cell Evolution detailing the endosymbiotic theory. Rose, A., S. J. Schraegle, E. A. Stahlberg, and I. Meier. 2005. Coiled-coil protein composition of 22 proteomes—differences and common themes in subcellular infrastructure and traffic control. In BMC Evolutionary Biology, Volume 5, article 66. This article contains material from the Science Primer published by the NCBI, which, as a US government publication, is in the public domain at http://www.ncbi.nlm.nih.gov/About/disclaimer.html. This page was last modified on 14 July 2010, at 15:14.